sometimes people ask me where i get my inspiration from... my best answer? musty old patterns like this one. :P i especially love those that hail from the 1970s and 80s. those two versions on the right of the above pattern are so killer; i'd wear the outfits shown in a heartbeat. 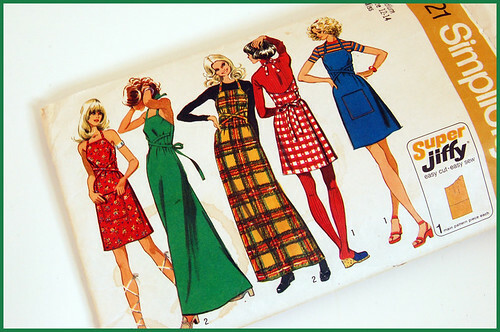 because i'm curious: does anyone know if there's a site for reviewing old sewing patterns, kind of like patternreview.com but something that's for older patterns/out of date patterns and the crazy people who like to sew them (aka, people like yours truly)? my final take? this particular pattern would probably be more suitable for a gal with a mile long torso and minimal boobage (like the drawings, haha!) (aka not me! ), but i like it anyway. 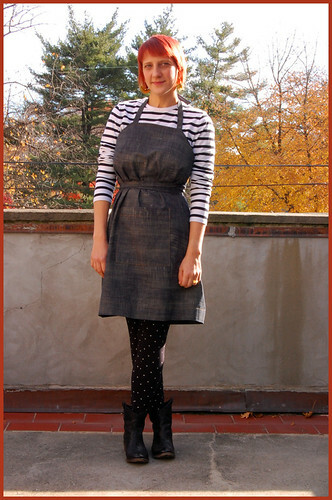 been obsessing over aprons/pinafores/jumpers/overalls lately, esp. in denims or colored denims. another permutation of my workwear love, rearing it's head, surely. i've been scouring etsy and ebay for old, interesting apron/apron jumper/overalls patterns like mad over the past couple months. have been amassing quite a little collection of said patterns.